MADISON—Cheri Maples, age 64, died in Madison on July 27, 2017, of complications from injuries she suffered in a September 2016 bicycle accident. Cheryll Ann Maples was born on Nov. 1, 1952, in Fort Sill, Okla., to Jarvis and Betsy (nee Christensen) Maples, and grew up in Oak Creek, Wis.
Cheri was a proud University of Wisconsin-Madison Badger, where she earned her Master’s of Social Work and Juris Doctor Degrees that launched her onto a distinguished life of service. Cheri was passionate about fighting injustice, racism, and abuse. She first worked for Dane County Advocates for Battered Women (now known as DAIS), and in 1981 became the first employee of the Wisconsin Coalition Against Domestic Violence (now End Domestic Abuse Wisconsin). Cheri’s true calling came when she responded in 1984 to then-Madison Police Chief David Couper’s call to join “Madison’s Peace Corps,” the Madison Police Department. Among the early female pioneers to graduate from the Madison Police Academy, and mentored by Chief Couper, Cheri rose through the ranks to Captain before retiring from the MPD in 2005. 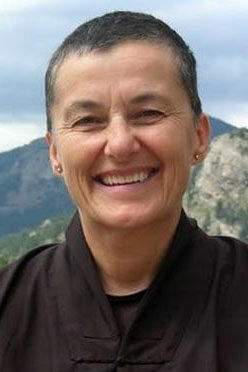 As Captain of Personnel and Training, Cheri gained prominence nationally by initiating mindfulness training for Madison Police Officers and, in the wake of 9/11, for organizing a national mindfulness retreat for criminal justice professionals led by Cheri’s beloved teacher, Zen Master Thich Nhat Hanh. After retiring from the MPD, Cheri went on to serve as head of Probation and Parole for the Wisconsin Department of Corrections and Assistant Attorney General in the Wisconsin Department of Justice. Cheri became a student of Thich Nhat Hanh in the late 1980s, knowing she had found her teacher when he affirmed there was no conflict between being a police officer and a Mindfulness practitioner by saying “Who else would we want to carry a gun but someone who will do it mindfully? Carrying a gun can be an act of love if done with understanding and compassion.” He ordained her as a dharma teacher in 2008, after which Cheri co-founded the Center for Mindfulness and Justice. One of Cheri’s focuses was on teaching and supporting Mindfulness throughout the criminal justice system, whether initiating Mindfulness classes for inmates in prisons or for police officers throughout the country. She also became widely known and beloved as a teacher to Buddhist laypeople and others interested in exploring the beautiful depths of Mindfulness. Cheri taught widely in the United States and abroad, and her spiritual “home” was Madison’s SnowFlower Sangha. Cheri was a tremendous athlete, an avid fan of the UW Badgers, Milwaukee Brewers and Green Bay Packers, and loved the details of virtually all sports—most especially baseball. In the days before her passing, she talked excitedly about the Brewers’ unexpectedly successful season, and she admired no human more than she admired Number 42, Jackie Robinson. She was preceded in death by her parents and her much-loved Aunt Imogene ‘Moe’ Christensen. Cheri is survived by her sons, Jamie Maples (Terri) of Fort Collins, Colo., Micah Maples of Madison; stepsons, Isaac Nadeau (Jenny Sallmann and their son, Hollis) and Luc Nadeau (Kris and children, Maia and Remy); stepdaughter, Bradie Wright (Mike Coulombe and their son, Alex); brother, Mark Maples (Sandy Magnuson) of Oshkosh; brother, Steve Maples (Cindi) of Redgranite; nieces, Kelsey Maples of New York, N.Y., and Kristen Maples (Sarah Hemmerich) of Madison; nephew, Cory Maples of Oshkosh; and her beloved dog, Bodhi. She also leaves a large community of loving and loved friends and students in Madison, the United States, and throughout the world. A public memorial service will be held on Sept. 26, 2017, at 7 p.m. at FIRST UNITARIAN SOCIETY OF MADISON, 900 University Bay Drive, and all are welcome. In addition, a previously scheduled daylong meditation retreat led by Sharon Salzberg to benefit Cheri will occur on Aug. 26, 2017, as scheduled, at Madison’s GOODMAN COMMUNITY CENTER. The retreat is sold out, but arrangements are being made to stream it live, and it will focus on honoring Cheri through Mindfulness practice, and contributions to the organizations designated below. Further details will be posted on the Facebook page of the Center for Mindfulness and Justice. Those wishing to honor Cheri’s memory may make donations to the Thich Nhat Hanh Foundation, https://www.thichnhathanhfoundation.org, and to three Madison-based organizations doing work about which Cheri was passionate: The Dane County Time Bank, http://www.danecountytimebank.org/, Freedom, Inc., http://freedom-inc.org/, and the Wisconsin Transgender Health Coalition, https://witranshealth.wordpress.com/. Cheri’s family deeply appreciates the wonderful staff at UW Hospital for their excellent care. Heartfelt thanks to Cheri’s extraordinary group of friends, who created the “love nest” that sustained Cheri, particularly since her bicycle accident. Among dozens of cherished friends who helped Cheri so much, we are especially grateful to Maureen Brady, Eileen Harrington, Mary Bennett, Julia Vance, Anne Whalen, Dawn Marie Zimmerman and Amy Krohn. Cheri touched countless lives, leaving an inspiring legacy of courageous activism, personal integrity and caring for all—no one left out. The day before she died, Cheri spoke her final teaching, with gratitude and humility: “I have had a great life.” To view and sign this guestbook, please visit www.ryanfuneralservice.com.